A professional process service company founded in 1963. Myers Attorney’s Services has been a family business since 1963 and currently offers Arkansas process service as well as private investigation, document retrieval, courier, background check, and document preparation services. Our aim is to save you hassle and time so that you can focus on what is important to you. To that end, Myers Attorney’s Services ensures that all our Arkansas process servers have completed classes and are certified through the Arkansas courts. Our professional and experienced team know all the civil rules and guidelines for process service, ensuring that your important documents are served by the book. We also work with a network of professional process servers across the country, ensuring that you can get documents delivered when you need them and where you need them. Since we know that your documents may need to be delivered on a tight deadline, we do offer expedited service. Out expedited service includes a courtesy phone call, so that you can be informed of the status of your assignment. Whether you need expedited service or not, all of our assignments are handled personally by professional process servers to ensure accurate and timely service of process. Myers Attorney’s Services also has a special software system in place to ensure that our customers can always check on the status of their service. Alternatively, you can call our offices and our friendly, professional staff will be happy to help you determine the status of your request. Process service: Our court-approved process servers are committed to ensuring that your documents are served in a timely and accurate fashion. Our professional process servers take classes and training to ensure that they follow all laws and guidelines to provide you with the highest quality service. Private Investigation Services: Our team can take on your disability cases, asset searches, domestic investigations, and other private investigation needs. Call our investigative team today to discuss your investigation needs. We now offer lake investigations any where in the state. Document Retrieval Services: Our staff can visit any court in Arkansas to ensure that you get the documents you need. Our service aims to save you the time and effort it can take to visit courts in person. Courier Services: We can deliver and pick up documents anywhere in Arkansas. Call us today to find out about our competitive rates. Background Check Services: If you need to know more about any individual or entity, our professional criminal, civil, and asset background checks can help you get the facts you need. Document Preparation Services: If you need help preparing subpoenas or case filings, we can handle this task as well as process service. Medical Review and Consulting: The review and analysis of medical malpractice cases. Contact us at (501) 376-6266 or fill out our form below today to discuss your needs. We are always happy to help you with a wide range of services and solutions designed to make your life easier. Our Arkansas process servers are often asked questions about process service. Perhaps you have had some of these same questions yourself. Service of process involves serving legal documents to individuals in a court case or legal action. This is an important part of the US legal process, as it ensures that everyone in a court case is duly informed of the legal action and has a chance to respond. I have been hearing a lot about invalid process service – what is that? There is a great deal involved in Arkansas service of process. Arkansas process servers must follow all civil rules and all laws related to service of process, for example. Breaking any laws can make the service of process invalid, which can affect or delay the court case. As well, the media has been filled with information about situations where there is an affidavit of service on which the signature is suspect. This can also make the service of process invalid. At Myers Process Service, we do everything possible to ensure that your service of process experience is hassle-free. 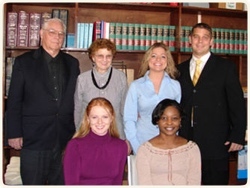 We work only with professional process servers who have been certified through Arkansas courts. All our Arkansas process servers have also taken educational classes, so that they know all the legal issues concerning service of process. We work hard to ensure that your process of service is accurate and by the book. What happens if I submit a service of process request to you? At Myers Attorney’s Services, we take a personal interest in every assignment. We will go over your needs and the specifics of your request. We will then quickly submit your assignment to our professional Arkansas process servers. Our process servers will attempt service and will keep our office aware of all attempts. You can check the status of your request by using our online software or by calling our office. Once your documents are successfully delivered, our process servers will submit an affidavit of service, which you can use to prove that the documents were served. If you have more questions about service of process in Arkansas, contact Myers Attorney’s Services today to speak to our experienced and friendly team. Call us at (501) 376-6266 or fill out our form for a process server today.